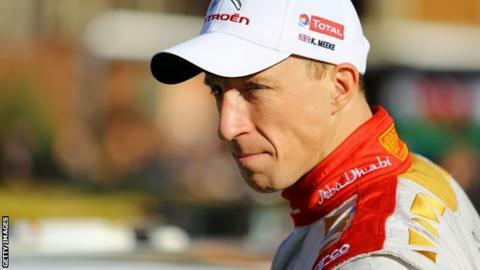 Kris Meeke clinched a first win for a British driver in the World Rally Championship series since 2002 when he triumphed in Rally Argentina on Sunday. Northern Irishman Meeke held on for victory as he finished 18.1 seconds ahead of his Citroen team-mate Mads Ostberg. The late Colin McRae's win in Kenya 13 years ago was the last previous World Rally triumph by a Briton. "This one's for Colin," said an emotional Meeke, 35, after his triumph. Scotman McRae, who was killed in a helicopter crash in 2007, was a mentor to Meeke during the early part of the Northern Irishman's career. "He helped my career out at the very beginning," added Meeke. "He supported me financially through to the world championship. Without his support I wouldn't be here." Meeke's overnight 38.6 second lead was cut by Ostberg in Sunday's two final stages but the Dungannon driver held on to take an emotional win in Villa Carlos Paz. Welshman Elfyn Evans earned his first World Rally Championship podium finish as he took third in his Ford Fiesta after Jari-Matti Latvala's Volkswagen suffered a breakdown on Sunday morning. Meeke, whose co-driver is Irishman Paul Nagle, had gone into the Argentina event under some pressure after a poor start to his 2015 campaign. The Dungannon man's early-season form had been hindered by a series of crashes as he finished 10th in Monte Carlo in January, seventh in Sweden and exited totally in Mexico. His victory gave Citroen their first World Rally Championship victory since former world champion Sebastien Loeb's win in Argentina two years ago. Citroen's one-two also ended a sequence of seven straight wins in the World Rally series for Volkswagen. Defending world champion Sebastien Ogier, who had won the five previous events, dropped out of contention in Argentina on Friday following a breakdown. Meeke's best previous World Rally Championship finishes were four third places last season. "You're as old as you feel and I feel like I am 21," added Meeke after his victory.